Abstract: An experiment was conducted at Field Laboratory of the Department of Crop Botany, Bangladesh Agricultural University to investigate the effect of Miyobi (Plant growth regulators, dissolved in water) on morpho-physiological, yield attributes and yield of onion cv. Taherpuri. The experiment comprised of four concentrations of Miyobi viz., 2, 3, 4 and 5 mgL-1 and fresh water as control and those were sprayed on onion plant at 40 and 60 days after transplanting. Foliar application of Miyobi increased plant height, leaf number, leaf length, leaf breadth, pseudo-stem diameter, number of roots, root length, absolute growth and yield contributing characters over control. Results revealed that morphological, growth and yield contributing characters and bulb yield increased with increasing concentration of Miyobi up to 4 mgL-1 and further increment of hormone concentration had adverse effect on plant growth and development. The highest plant height, leaf number, leaf length and breadth, pseudo-stem diameter, root number, root length, total dry mass production and absolute growth rate was recorded in plants treated with 4 mgL-1 Miyobi solution followed by 3 mgL-1 with same statistical rank. In control plants where only water was sprayed, the above studied parameters were the lowest. The bulb yield was recorded maximum at 4 mgL-1 Miyobi (11.38 t ha-1) due to increased bulb length, bulb diameter and single bulb weight which was statistically similar to 3 mgL-1 (11.34 t ha-1). In contrast, 5 mgL-1 Miyobi had the adverse effect on yield attributes and yield compared to 3 and 4 mgL-1 Miyobi application indicating inhibitory effect of Miyobi at high concentration of 5 mgL-1 on onion. Thus Miyobi with 3 or 4 mgL-1 may be applied for increased bulb yield of onion. Islam, M. Z., Mondal, M. M. A., Akter, M. B., Mazumder, M. N., Rani, M. H. and Islam, M. O. (2017). Effect of foliar application of miyobi on growth and bulb yield of onion. Journal of Bioscience and Agriculture Research,15(01), 1231-1237. Islam, M. Z., Mondal, M. M. A., Akter, M. B., Mazumder, M. N., Rani, M. H. and Islam, M. O. "Effect of foliar application of miyobi on growth and bulb yield of onion". Journal of Bioscience and Agriculture Research,15.01(2017), 1231-1237. Islam, M. Z., Mondal, M. M. A., Akter, M. B., Mazumder, M. N., Rani, M. H. and Islam, M. O. "Effect of foliar application of miyobi on growth and bulb yield of onion". Journal of Bioscience and Agriculture Research,15 no.01(2017), 1231-1237. Authors: Islam, M. T., Shamsuzzoha, M., Rahman, M. S., Haque, M. M. and Alom, R.
Authors: Hossain, M. I., Jahan, N. and Ggulandaz, M. A.
Abstract: A low cost robust tri-cycle garden boom sprayer has been developed in Farm Machinery & Postharvest Process Engineering Division of BARI Gazipur and all set up installed on a tri-cycle rickshaw van. It has been further improved with flexible boom which allow spraying in tall fruit trees and evaluated for mango and litchi trees. Crop yields are reduced mainly due to attack of pests, diseases and weeds. The developed boom sprayer consists of small diesel engine, high pressure pump, pesticide tank, boom with nozzle, and tri-cycle. The chemicals are sprayed as the most effective and efficient techniques for applying small volume of spray liquid to protect horticultural crops. The boom sprayer was tested for spraying pesticide in fruit trees to produce uniform effective spray pattern using minimum amount of spray materials. The spray boom has hollow nozzle and can spray in tall tree. The effective field capacity of the sprayer was 0.3 ha/hr under 3 bars pump pressure. The average spray capacity 2.85 lit/min at 3 bar pressure. The power requirement is 4 kW for operating the pump. Operating cost of garden boom sprayer was Tk. 595/day and foot sprayer was Tk.1029/day, respectively (1US$=Tk. 80.0). The entire boom assembly fixed on a rickshaw van behind the operator seat. It is safe in adverse wind condition. To facilitate convenience operation for the operator, the design of the entire controls provided near the operator hand. A transparent plastic tank was provided for clear view of pesticide status in the tank. Hossain, M. I., Jahan, N. and Ggulandaz, M. A. (2017). Development of low cost tri-cycle garden boom sprayer for fruit trees in Bangladesh. Journal of Bioscience and Agriculture Research,15(01), 1255-1259. Hossain, M. I., Jahan, N. and Ggulandaz, M. A. “Development of low cost tri-cycle garden boom sprayer for fruit trees in Bangladesh”. Journal of Bioscience and Agriculture Research, 15.01(2017), 1255-1259. Hossain, M. I., Jahan, N. and Ggulandaz, M. A. “Development of low cost tri-cycle garden boom sprayer for fruit trees in Bangladesh”. Journal of Bioscience and Agriculture Research, 15. no. 01(2017), 1255-1259. Authors: Ahmad, M., Amrao, L., Habib, S., Ahmed, M. Z., Ahmed, A. and Ghuffar, S.
Abstract: Golden dewdrop (Duranta erecta) is an ornamental plant which is commonly grown in Pakistan due to its natural beauty and medicinal properties. It is mainly grown in tropical and sub-tropical region. Golden dewdrop is known to suffer many diseases. Among all golden dewdrop leaf curl disease is caused by the begomovirusis very common. This study analyzed the DNA- A component of begomovirusin by using PCR-RFLP. For this purpose survey was conducted from ten different locations in UAF (University of Agriculture Faisalabad) from golden dewdrop plant according to the typical symptoms such as upward curling of leaves, darkening and thickening of veins, stunting of plant size. Infected samples were brought into Virology lab in CABB (Centre of Agricultural Biochemistry and Biotechnology). For DNA extraction CTAB method was used but DNA was not showed due to low concentration after quantification through spectrophotometer which was less than 100ng/µl. Therefore Rolling Circle Amplification method (RCA) was used for amplification of DNA-A component which only amplified two samples (D1 and D2) successfully. For polymerase chain reaction universal primers β01 and β02 was performed on RCA products for amplification of DNA-A component of begomoviruses which amplified the DNA at 2.8 kbp. For diversity analysis three commonly restriction enzyme Pst1, Sac1 and BamH1was used which restrict the DNA at different bp. Final conclusion of the analysis describe about the diversity of begomoviruses in golden dewdrop which emerging as an alternate host for begomoviruses. Ahmad, M., Amrao, L., Habib, S., Ahmed, M. Z., Ahmed, A. and Ghuffar, S. (2017). Diversity analysis of begomovirus in golden dewdrop (Duranta erecta) through PCR-RFLP. Journal of Bioscience and Agriculture Research,15(01), 1260-1265. Ahmad, M., Amrao, L., Habib, S., Ahmed, M. Z., Ahmed, A. and Ghuffar, S. “Effect of seed priming on growth and physiological traits of five Jordanian wheat (Triticum aestivum L.) landraces under salt stress”. Journal of Bioscience and Agriculture Research, 15.01(2017), 1260-1265. 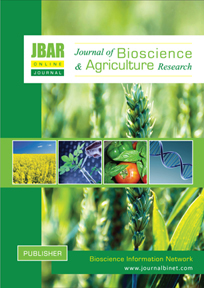 Ahmad, M., Amrao, L., Habib, S., Ahmed, M. Z., Ahmed, A. and Ghuffar, S. “Effect of seed priming on growth and physiological traits of five Jordanian wheat (Triticum aestivum L.) landraces under salt stress”. Journal of Bioscience and Agriculture Research, 15. no. 01(2017), 1260-1265. Authors: Bari, M. R., Ali, M. A., Miah, M. G. and Abdullah, M. R.
Abstract: To determine the diveisty and uses of medicinal plants the study was conducted at twenty villages Haluaghat upazila of Mymensingh district, Bangladesh. Seventy five households were randomly selected and data were collected using structured questionnaires and resulted in the documentation of 87 useful medicinal plant species belonging to 51 families including trees (40%), herbs (32%), shrubs (20%) and climber (8%). The Fabaceae and Zingiberaceae family provided the largest number of species (5 plants) followed by Apocynaceae, Combretaceae and Euphorbiaceae (4 plants from each family). Among the identified plants 80 species uses against human disease, 11 species used against animal disease and 10 species used for pest control. Leaf was used in the majority of cases for medicinal preparation (52 species), followed by fruits (21 species), roots (19 species), seeds (13 species), barks (15 species) and besides these, rhizome, flower, latex as well as whole plant were used. Unfortunately, medicinal plants are increasingly threatened by various environmental, socio-economic and institutional problems. In the study area some medicinal plant species (Neem, Khejur, Mandar, Ulot kambal, Sazna, Bael and Amloki) were found well adapted for many years. However, proper training with adequate supply of desired medicinal plant species are required and credit facilities would be helpful for large scale cultivation of medicinal plants. Bari, M. R., Ali, M. A., Miah, M. G. and Abdullah, M. R. (2017). Diversity of medicinal plants in Haluaghat upazila of Mymensingh and their uses. Journal of Bioscience and Agriculture Research, 15(02), 1266-1273. Bari, M. R., Ali, M. A., Miah, M. G. and Abdullah, M. R. “Diversity of medicinal plants in Haluaghat upazila of Mymensingh and their uses”. Journal of Bioscience and Agriculture Research, 15.02(2017), 1266-1273. Bari, M. R., Ali, M. A., Miah, M. G. and Abdullah, M. R. “Diversity of medicinal plants in Haluaghat upazila of Mymensingh and their uses”. Journal of Bioscience and Agriculture Research, 15. no. 02(2017), 1266-1273. Abstract: A woman is the nucleus of the family, particularly, in rural India and almost fifty percent of the population is being discriminated at all fronts. Entrepreneurship development is the only possible ways to empower women group. To this end, BAIF Munger organized training on summer moong production technique for women groups in BAIF’s office, district Munger with the help of KVK Munger scientist sunder TARINA project. The study was conducted in 2 villages of Munger districts of Bihar during 2016-2017 to design a framework for empowering farm women with improved pulse production technologies. A total of 46 farm women were randomly sample selected for the study of knowledge improvement of women. Knowledge improvement of women farmers after training was highest in the subject matters like seed treatment which increased from 30 % to 91% , irrigation from 23 to 78%,fertilizer application from 30 to 82%,land preparation from 30 to 80% , picking from 40 to 89% ,insect and pest control from 29 to 77% ,manure application from 23 to 70%,threshing from 42 to 88 % respectively. Majority of women farmers expressed limited availability of quality seeds and lack of information on suitable improved varieties as the major problems. After harvesting of crops, production data was collected. The women farmers got 1.4 to 1.6 qt of pulse grain in 0.25 acre area. Singh, V. K., Singh, A. P., Yadav, S. N. and Bharati, P. (2017). Empowering women in summer pulse production. Journal of Bioscience and Agriculture Research,15(02), 1275-1278. Singh, V. K., Singh, A. P., Yadav, S. N. and Bharati, P. “Empowering women in summer pulse production”. Journal of Bioscience and Agriculture Research, 15.02(2017), 1275-1278. Singh, V. K., Singh, A. P., Yadav, S. N. and Bharati, P. “Empowering women in summer pulse production”. Journal of Bioscience and Agriculture Research, 15. no. 02(2017), 1275-1278. Authors: Jaman, M. R., Hassan, M. F., Rabbani, M., Suvo, T. P. and Ahmed, M. R.
Abstract: Mango fruit consumers often confuse to select exact fruits from markets. A study was conducted to analyze the physical quality and biochemical componentsat different stages ofmango cultivar “Amrapali”.The study was conducted at the postharvest laboratory, Department of Horticulture, PSTU during the period from January to December 2015. Stage-1 was marked when the peel color was dark olive green and turning toyellow at the seedand the subsequent maturity stages determined at 2-days intervals as stage-2 was olive, stage-3 was apple green, stage-4 was brown, stage-5 was saddle brown and stage-6 was dark golden rod in color. At each maturity stages, physical (peel color, firmness and weight loss) and biochemical (anthocyanin content, titratable acidity, pH, total soluble solids, ascorbic acid, reducing sugar, non-reducing sugar and total sugar) maturity indices were determined. The pH (4.54), anthocyanine content (430 mg/100 g), TSS (24.33%), reducing sugar (7.56%), non-reducing sugar (5.84%) and total sugar (13.40%) were significantly highest at stage-6 (dark golden rod colour). The titratable acidity (0.30%) and ascorbic acid (25.29 mg/100 g) were significantly highest at stage-1 (dark olive green). Firmness decreased gradually with the advancement of maturation and flesh color turned dark olive green to dark golden rod. Total soluble solids were increased while TA was gradually decreased with increase of maturity. Dark olive greencolour stage (stage-1) is suitable for harvesting and transportation due to highest physical qualityand dark golden rod colour stage(stage-6) is suitable for consumption due to highest biochemical composition. Jaman, M. R., Hassan, M. F., Rabbani, M., Suvo, T. P. and Ahmed, M. R. (2017). Response of physical quality and biochemical characteristics to different maturity stages of Mangifera indica (cv. Amrapali). Journal of Bioscience and Agriculture Research,15(02), 1279-1286. Jaman, M. R., Hassan, M. F., Rabbani, M., Suvo, T. P. and Ahmed, M. R. “Response of physical quality and biochemical characteristics to different maturity stages of Mangifera indica (cv. Amrapali)”. Journal of Bioscience and Agriculture Research, 15.02(2017), 1279-1286. Abstract: Spot blotch disease caused by Bipolaris sorokiniana (Sacc.) shoem. is one of the most destructive diseases of wheat (Triticum aestivum L.) in plain areas of Nepal. Triazoles fungicides are expensive but effective against the disease. The experiment was conducted to identify the most efficient spray schedules of Tilt (Propiconazole 25 ec) fungicide against spot blotch disease in wheat. The experiment was carried out at National Wheat Research Program, Bhairahawa, Nepal in Randomized Complete Block Design with three replications and 12 treatments. The treatments comprised of frequencies of spray, days for spray after the seeding date and intervals between two sprays. Both two and three sprays of Propiconazole fungicide remarkably reduced the severity of spot blotch disease, but single spray hadn’t any effect on spot blotch disease. Two sprays at 70 and 85 days after seeding (DAS) were the most effective among the tested treatments against spot blotch disease. The spray of fungicide at early crop stage (before 50 DAS) and very late crop stage (after 80 DAS) had less effect on spot blotch disease AUDPC. There weren’t significant differences in spot blotch AUDPC between the spray schedules having 10 and 15 days intervals. Grain yield and Thousand Grain Weight (TGW) were significantly higher in some treatments having tilt spray as compare to the control. The single spray had no impact on yield increments; however, two and three sprays significantly increased the grain yield. Cost effective assay of Propiconazole against spot blotch disease shows that one, two and three sprays of fungicide are beneficial for both seed and grain production purposes under Nepalese conditions. In conclusion, spray of Propiconazole fungicide at appropriate time periods manages the spot blotch disease, increases the yield and is cost effective in both seed and grain production schemes for the farmers of Nepal. Bhandari, D. (2017). Identification of best spray schedules for Propiconazole fungicide against spot blotch disease in Wheat. Journal of Bioscience and Agriculture Research,15(02), 1287-1293. Bhandari, D. “Identification of best spray schedules for Propiconazole fungicide against spot blotch disease in Wheat”. Journal of Bioscience and Agriculture Research, 15.02(2017), 1287-1293. Bhandari, D. “Identification of best spray schedules for Propiconazole fungicide against spot blotch disease in Wheat”. Journal of Bioscience and Agriculture Research, 15. no. 02(2017), 1287-1293. Authors: Adugna, O., Alemu, D. and Melkamu, T.
Abstract: Gullies are common features throughout the Ethiopian Highlands. Induced environmental degradation comprises not only the loss of soil volume and of arable lands but also the triggering of landslides or off-site sedimentation problems. This experiment was initiated with the aim of evaluating the effect of brush (bamboo) wood with stone check dam on soil and water conservation (gully rehabilitation) at Benishangulgumuz region of Assosa zone (Assosa district of selga-19 for two consecutive research years (2013/14-2014/15) on farm land. The gully site was selected purposively based on the prevalence of gully erosion. Biophysical and socioeconomic data were collected from the gully and participant farmers to evaluate the effectiveness of the measures. The potential of the check dam to conserve the soil was evaluated by using the pin installed in front the check dam to observe the change of gully depth, cross sectional area and soil loss data were collected. A total of 22 households were sampled to assess the perception, acceptance and adoption level of the farmers using simple random sampling technique. Result indicates that the gully depth and volume of soil loss were reduced from 0.94m to 0.58m and volume of soil loss from 468 ton/ha/yr to 204 ton/ha/y. The interviewed farmers response also indicated that all (100%) of them were mentioned the presence and severity of soil erosion on their farm land and which is increasing from time to time in alarming rate and where all of the farmers mentioned loss of fertile top soil and in turn yield reduction as its integral effect. 95.5% of the farmers were confident enough to rehabilitate the gully using bamboo with stone check dam by supplementing with other biological measures and all (100%) of the farmers ratified the effectiveness of the measures to rehabilitate the gully and willing to implement on their farm land thereby to disseminate the technology to non-participant farmers. Adugna, O., Alemu, D. and Melkamu, T. (2017). Evaluation of brush wood with stone check dam on gully rehabilitation. Journal of Bioscience and Agriculture Research,15(02), 1294-1300. Adugna, O., Alemu, D. and Melkamu, T. “Evaluation of brush wood with stone check dam on gully rehabilitation”. Journal of Bioscience and Agriculture Research, 15.02(2017), 1294-1300. Adugna, O., Alemu, D. and Melkamu, T. “Evaluation of brush wood with stone check dam on gully rehabilitation”. Journal of Bioscience and Agriculture Research, 15. no. 02(2017), 1294-1300.